Dr. Beaujean joined the Psychology & Neuroscience department in 2017. 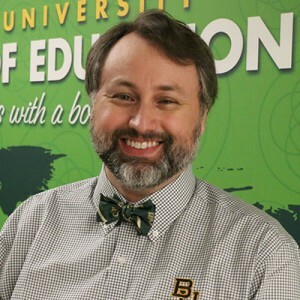 Prior to joining, he worked in Baylor's Educational Psychology department where he created and coordinated the quantitative methods specializations for the doctoral and master's programs. In addition, he contributed to the school psychology program and served as the program coordinator for two years where he developed the program's doctoral specialization. Dr. Beaujean is a prolific scholar, having published 2 books on latent variable models, more than 80 articles and book chapters in peer-reviewed scientific outlets, and presented more than 80 papers/posters at professional conferences. In 2016, he was listed as one of the most prolific faculty members in non-doctoral school psychology programs across the nation, and has won research awards from the American Academy of Health Behavior, American Psychological Association (school psychology division), Mensa Education & Research Foundation, and Society for Applied Multivariate Research. He has been previously awarded funding from the National Institutes of Health, and aided in program evaluations for the National Science Foundation, Inter-American Development Bank, and Lego Foundation. Moreover, multiple organizations and universities have invited him to speak on the issue of data analysis and psychological measurement. In addition to his scholarship, Dr. Beaujean has extensive experience with psychological assessment in both school and clinical environments. He holds licensure for the independent practice of psychology in Texas. In 2015, his advanced clinical competence was recognized by the American Board of Assessment Psychology when they awarded him a diplomate in Assessment Psychology. Dr. Beaujean's research interests are broadly in the field of individual differences. More specifically, he is interested the application of quantitative methods to study human variability, especially as it relates to cognitive ability and educational outcomes. For additional information about Dr. Beaujean's research, please see the website for Baylor Psychometric Laboratory. Beaujean, A. A. (2014). Latent variable modeling using R: A step-by-step guide. New York, NY: Routledge/Taylor and Francis. Loehlin, J. C., & Beaujean, A. A. (2016). Latent variable models: An introduction to factor, path, and structural equation analysis (5th ed.). New York, NY: Routledge. Beaujean, A. A., & Jensen, A. R. (2002, July). SASP Interviews: Arthur R. Jensen [Interview with Arthur R. Jensen]. SASP News, 2(4), 8-19. Beaujean, A. A., & Osterlind, S. J. (2008). Using item response theory to assess the Flynn effect in the National Longitudinal Study of Youth 79 Children and Young Adults data. Intelligence, 36, 455-463. Beaujean, A. A., & Parkin, J. (2013). Using R for the analysis of cognitive abilities and behavior genetic data. In J. Kush (Ed. ), Intelligence quotient: Testing, role of genetics and the environment and social outcomes (pp. 129-168). New York, NY: Nova Science. Beaujean, A. A., Parkin, J., & Parker, S. (2014). Comparing Cattell-Horn-Carroll models for predicting language achievement: Differences between bi-factor and higher-order factor models. Psychological Assessment, 26, 789-805. Beaujean, A. A., & Sheng, Y. (2014). Assessing the Flynn effect in the Wechsler scales. Journal of Individual Differences, 35, 63-78. Beaujean, A. A. (2015). Adopting a new test edition: Psychometric and practical considerations . Research and Practice in the Schools, 3, 51-57. Beaujean, A. A. (2015). John Carroll's views on intelligence: Bi-factor vs. higher- order models. Journal of Intelligence, 3, 121-136. Benson, N., Beaujean, A. A., & Taub, G. E. (2015). Using score equating and measurement invariance to examine the Flynn effect in the Wechsler Adult Intelligence Scale. Multivariate Behavioral Research, 50, 398-415. Frisby, C. L., & Beaujean, A. A. (2015). Testing Spearman's hypotheses using a bi-factor model. Intelligence, 51, 79-97. Beaujean, A. A. (in press). Commentary on "Strengths and Weaknesses in the Intellectual Profile of Different Subtypes of Specific Learning Disorder" (Toffalini et al., 2017). Clinical Psychological Science. Beaujean, A. A. (in press). Identifying Cultural Effects in Psychological Treatments Using Aptitude- Treatment Interactions. In C. L. Frisby & W. O'Donohue (Eds. ), Handbook of Cultural Competence in Applied Psychology: Theory, Science, Practice, and Evaluation. New York, NY: Springer. Beaujean, A. A. (in press). Simulating data for clinical research: A tutorial. The Journal of Psychoeducational Assessment. Benson, N. F., Beaujean, A. A., Donohue, A., & Ward, E. (in press). W scores: Background and derivation. The Journal of Psychoeducational Assessment.